(Februay 2015) Editor’s note: Now that both the Australian and Canadian Wheat Boards have been killed, it is fair to say essentially 100% of the world’s grain is now traded by the ABCD group. See graphs following and below. 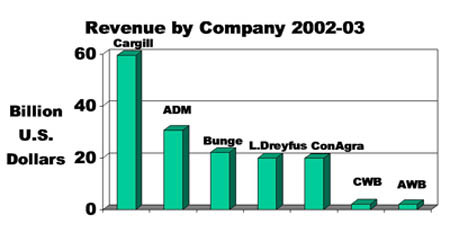 ABCD group (Archer Daniels Midland, Bunge, Cargill, and Louis Dreyfus) plus a fifth commodity trader out of Switzerland known as Glencore that has most of the Canadian grain facilities originally built by the farmer-owned Wheat Pool Cooperatives. Glencore’s gross revenue was $233 billion of which about $30 billion was from its agricultural operations around the world. 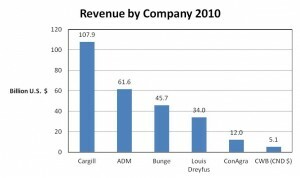 (August 2011) Some folks really believe there is something called an “open market” for grain. In fact over 80% of the grain on the planet trades in a private market. Just like when you make a deal with your neighbour to sell him something, it is nobody’s business but your own. It is the same in the global grain market. 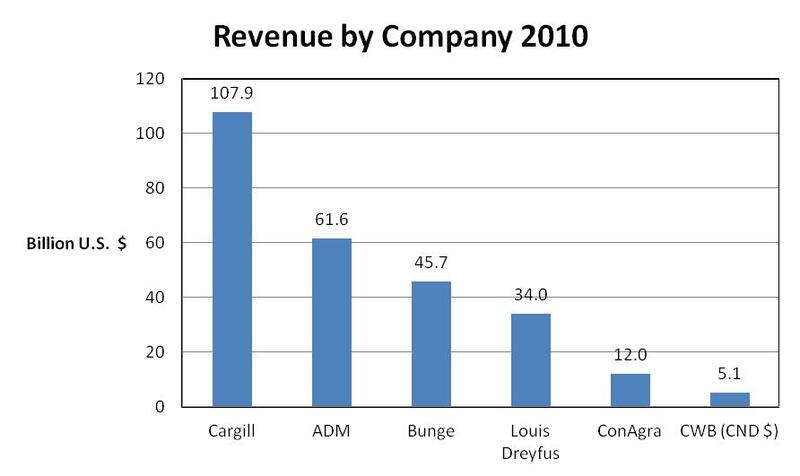 Five giant companies trade and handle over 80% of the world’s grain. Whether it is American barley or wheat from Argentina, one of the big five buys it from the farmers and then re-sells it at a profit. The only exception in this long standing system is the western Canadian farmer. Just over 75 years ago farmers organized their own sales department to compete in that global grain market. They called it the Canadian Wheat Board and the private trade has been complaining ever since. The Board is everything the private trade is not. The private trade is secret; just try to get information on what they pay for rail shipping or how much they charge farmers for the “risk” of buying and then re-selling their canola. In contrast the CWB makes all that information public. You can get a full independently audited financial statement from the CWB every year. Independent auditors and academics confirm that better than 90% of the money the CWB takes in for grain sales around the world goes to the farmers who produced it. Farmers then pay for rail transportation subject to the “maximum revenue entitlement” administered by the Canadian Transportation Agency. After the private trade pays off its owners, the bankers, and other investors, can any of them claim the same return for farmers? Not very likely, but we will never know, because most of these giant companies do not have to tell anyone anything. It is all private. Relative size of private companies verses former CWB and former AWB.